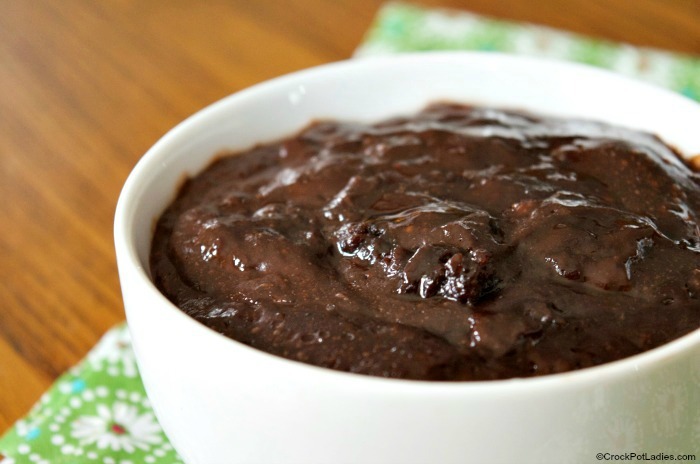 This recipe for Crock-Pot Brownie Pudding could not get any easier to make. 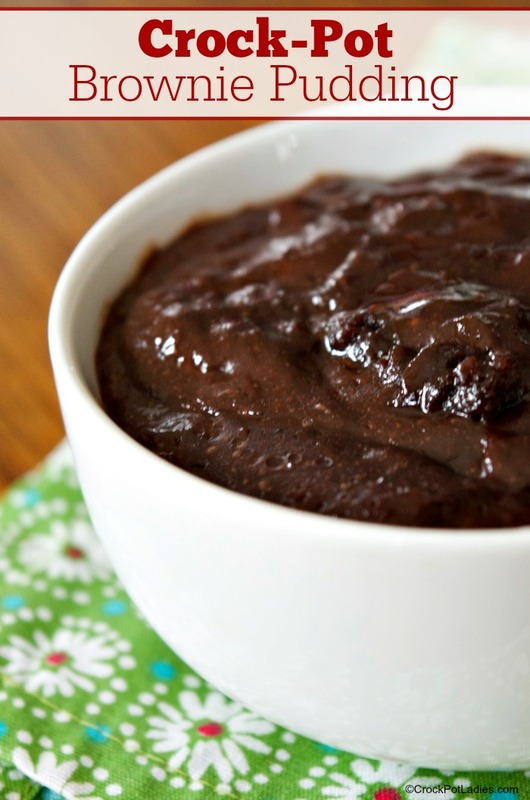 A boxed brownie mix and instant pudding is cooked together for a ooey gooey chocolate dessert! 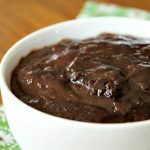 This slow cooked brownie pudding really satisfies that chocolate craving you get from time to time. There is two delightful chocolate layers to this dessert. A fudgy brownie bottom and a creamy chocolate pudding layer but both layers cook right in your slow cooker. This dessert is best served warm, just spoon some out (making sure you get both layers) into a bowl and eat with a spoon. If you want to take this ooey gooey chocolate dessert over the top though, top each serving with a scoop of vanilla ice cream or whipped cream. With only a handful of ingredients this chocolaty recipe is perfect for dessert. Serve it warm with a scoop of vanilla ice cream to take it over the top! Spray a 5 to 6 quart slow cooker with non-stick cooking spray and set aside. In a large bowl prepare the brownie mix by mixing together with the vegetable oil, water and eggs until well combined. Pour batter into prepared slow cooker. In a small bowl whisk together the dry instant pudding mix and 2 cups of milk together and pour pudding over the brownie mix in the slow cooker. Cover and cook on HIGH for 2 to 3 hours. Serve warm plain or with whipped cream or ice cream. Depending on your slow cooker, this recipe can take up to 3 hours to cook. The pudding on top will stay wet even though the brownie mix is cooked. Watch the edges. When the brownie mix on the edges looks dry and cooked, then this is complete. If you want to add in some chopped up candy bars (Hershey's chocolate or even a Snickers bar), drop the candy in on top of the brownie batter but before the pudding. I only have a 2-quart crockpot. Can I make this in the oven? Also, instead of chopped cany bars on top can I use chocolate chips? Is this good served cold. Sounds yummy and I’d like to bring it for a pot luck. Hi Patricia, we have not tested this recipe in the oven so cannot advise on exact cooking times. If I had to guess I would say cover the pan and cook close to the cooking instructions on the box of brownie mix…maybe just a little bit longer. And I am sure chocolate chips would be fabulous. Hi Wanda, we have not tested this recipe halved, but if you give it a try let us know how it comes out! I have a question if this Delicious sounding Dessert may be fixed in a 3 quart crock-pot? Didn’t know if you had the time and how long for a 3 quart? It may even be a 3 1/2quRt crock. As I’m typing that thought just came to my mind. Thank You Very Much for any information that You might be able to help me out! Hi Sarah, we have not tested this recipe in a 3 or 3.5 quart slow cooker so it is a little hard to say weather it will work. I think it will though. I am just not sure if I can give exact cooking times. I would cook according to the regular directions and then adjust the cooking time as it will probably cook a little bit longer. Do I make the pudding to the normal consistency? Hi Greg, in this recipe you mix the dry pudding mix with 2 cups of milk.